For the Conversion Kit version of Brother Gherinn, see Brother Gherinn (Conversion Kit). Each time you perform an attack, after the dice are rolled, you may suffer 1 to add +1 to the results. Limit once per attack. Use after you defeat a monster. Roll 2 red power dice. You and each hero within 3 spaces of you recover equal to the rolled. We must suffer and purge our souls unto life, for the flame shall be our judge. “The priests of Kellos took me in and gave me shelter. They asked me nothing of the many heinous crimes in my past. But like all members of the Brotherhood, in time I had to face the purifying fire, and all my many transgressions became evident in the form of scars and burns over much of my body. I am a different man, now. I follow a different path, but I cannot forget my past. Only an act of true bravery, facing Dragonfire Dungeon and bringing back valuables for my brethren, will free me from the shadows of my past." 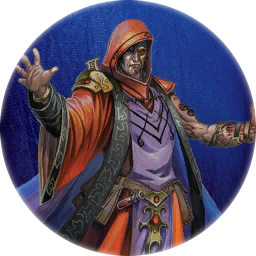 Brother Gherinn is a priest of great faith, and he believes that only by facing the dangers of the dungeon can he cleanse his soul. As a priest of Kellos, Brother Gherinn is no stranger to searing flames. Beneath his mask, Brother Gherinn’s face is scarred by the terrible burns inflicted on him by a ritual of purification. He never speaks of the man he was before that fiery ordeal, instead simply claiming that the agony was a small price to pay to gain control over his own dark nature. He now uses his mastery of unknowable energies to heal those in need and vanquish the wicked, hoping to wash away the crimes of his past. By climbing to the height of the mystical mountain, Brother Gherinn may finally find true redemption. Brother Gherinn first appeared in the third edition of DungeonQuest, published by Fantasy Flight Games. This page was last modified on 4 August 2017, at 23:37.